While so many sports media properties are putting their focus towards digital efforts, Bleacher Report has an eye on a tried and true way of generating revenue: Merchandising. Jumpstarting this effort is the announcement of The ‘D. Wade World Tour’ line, a collaboration with Miami Heat legend Wade. 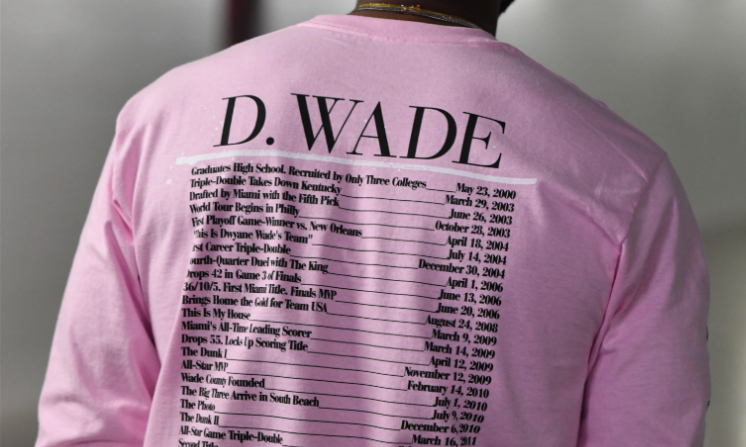 The line includes a series of branded t-shirts ($29), long sleeves ($39), hoodies ($75), and hats ($25), all of which incorporate imagery and references to moments and achievements from Wade’s 15-year NBA career. Those interested in seeing the full line in action should watch Wade’s walk towards the locker room before games as he plans to wear the gear when he enters the arena before upcoming games.
.@DwyaneWade's rocking a "world tour" shirt with his best career moments on it 👀 What was your favorite? Bleacher’s initial commercial efforts were more focused around one item, such as the “Hoodie Melo” sweatshirt from 2017. This new effort requires much more coordination and the expansion of their commerce department. They currently have five members and recently hired a director of operations and head of design. All of that said, don’t expect Bleacher Report to pull focus from its other efforts towards commerce. While it’s a growing revenue stream for the company, it’s still small compared to their web presence, apps, and B/R Live subscription service. Of course, those platforms also provide good marketing tools to promote their clothing lines as well. The company also plans to promote the branded clothing lines during NBA broadcasts and at a Bleacher Report event during the 2019 NBA All-Star Game.